Aye, it is that time... my holiday is over. I leave bonny Scotland tonight for home. Okay, where did I leave off last time. Starlight Express/ London Day I believe? Well, that was an interesting muscial to say the least. My roomies weren't too impressed with it. I didn't mind it. It's about trains. Perhaps if we were all 20 years younger we would have gotten more out of it. We capped the evening off with a night out dancing. Krista and I met a South African couple and a gal from Wales who live in London. We're hopping to meet up with them again soon. We had a good time... perhaps too much fun. My Sunday was spent at home. My cold (amoung other things) hit me at full force. ...However I think I may have just destroyed that relationship as I was supposed to be there today and I'm still in Scotland! They asked me back for the first two days after half-term. I decided to extend my trip (details later) and therefore bailed on them... I'm hopping my agency got my phone message in time! It's not such a loss tho', it's a pretty rough school. It's surrounded by council estates ("the projects") and there are a number of very challenging classes and individual students. To give you an idea of the neighbourhood, on Wednesday the school grounds were closed off shortly after school (no one allowed in or out) because of a "firearms issue" in the street. For you teachers out there... it just happened to be parent evening. :-) Great timing, eh?! Then on Friday Krista and I escaped to Scotland! We took the night coach to Edinburgh. It wasn't as bad as I thought and although I didn't sleep much I wasn't too tired when we arrived at 7 in the morning. We then hopped on to another bus: Haggis. We had purchased a flexi-tour pass with this company. Basically it provided door-to-door coach service to set towns around Scotland. As well the drivers served as guides, telling us about the countryside, history, etc. The buses often stopped for 30 min - 1 hour at some monuments, etc along the way. So it wasn't quite a tour (you're not with the same people all doing the same thing for the whole trip) but it helped us maximize our short stay ... we didn't ever have to worry about catching/ waiting for buses or trains. Nor did we have to worry about accomidation as there were very few tourists about. Once you are in the town, you are on your own which suited us just fine. Our fist stop was at Oban. This was a great little town on the West coast. The gateway to the Isles. We stayed here for 2 days and SHOPPED! It was the end of the tourist season so there were lots of sales on wool stuff... which is just what we needed as it was also getting colder in London. We, of course, checked out the local whiskey distillery which produces one of the well known single malt whiskeys in Scotland. Our next stop was just overnight near Fort William. Then we were off to Skye. We had a great time here. There were about 7 or so other Flexis who we ended up travelling with for the next four days. We went on a very windy and rainy tour of sky with an absolutely hilarious guide. (Nick's tours... highly recommended, he's nuts) Spent the 2 evenings in the pub and one of those was a disco night.... good fun. From there we most of us went to Carbisdale Castle in the North. It is a castle that was donated to the YHA. And it's haunted. We had a fab meal that we all cooked (£1.50 each), a few spooky walks around the grounds and a good chat session which lead to a human pyramid some how. The next day was to take Krista and I all the way back to Edinburgh... a long day on the bus. We were supposed to spend one night there but Krista wanted to take the early bus back as she had to work on Monday and wanted some time to get sorted. So I decided to extend my stay by 2 days because I was feeling like I was rushing through Scotland and one of the reasons I chose to sub was to have the flexibility to travel. Sooooooo... I jumped off at Pitlochry by myself. Pitlochry is the gateway to the highlands. It is surrounded by mountains and a gorgeous countryside. Lots of walkers come here. I went to the nearby castle that first day, as it was the last day it was open for the year. My second day there was an absolute riot. It started off ominously. 1) There was a school group of juniors staying in the hostel and making lots of noise. I decided to stay in bed and avoid them... but missed breaky as a result. 2 small walks) and went by the first local distillery... walked around, noticing that it was fairly deserted. However another family was there taking pictures and the like, so I went to the shop to see if it was open and if they offered tours. I opened the door... it was pitch black inside. Hmmm. Then as I came out I noticed a new sound. An alarm. Hmmm. Time to leave. Now as luck would have it things come in threes and my bad luck seemed to pass for the time being. I continued my walk. It was nice to be alone with my thoughts, as I'd been with people 24/7 since my excursion to Winchester. There was a lovely woods with a great waterfall. Then I headed to the second distillery, the smallest in Scotland. It was so quaint and pretty. The tour was free and included a tasting. Then, I continued my walk which led back to town, not before many great scenic views. I had lunch and then began my second walk. Now it was getting blustery and threatening rain by now, however I didn't let that stop me. In fact, I decided to extend my walk by making a detour to see up close a castle ruin. This ruin was still on a footpath, just not on the walk I'd planned to follow. So I'm in this farmer's field walking around the castle (which is fenced off) when I notice the herd of cows in the distance. Not hairy coooooos (highland cattle), just yer regular cows. They look up and see me. I continue to investigate and notice that they are ALL coming towards me. Hmmm, interesting. I decide to go back the way I came to get a photo and return to my walk. I do so and start walking along the path to the stile out of the field. I take a look back and notice the cows have diverted their course to the castle to follow me. Hmmm. I keep walking. I look back again. The bigger cows are now trotting. Hmmmm. I pick up the pace. So do they. They start coming quicker and quicker. I decide to be on the safe side and run the rest of the way to the stile and hop over. They stop and start moooing at me. "Piss off" is what I imagined them saying. As I walk away I turn around again and they are ALL at the stile I'd just gone over and begin mooing at me again. :-) True! I continued my walk and it started raining miserably for the last 1/2 hour. That evening as I was drying off in the hostel I was chatted up by an old man staying there (70ish) and my roommate who was about 50. She had heard about a local concert and the two of us went. It was an absolute riot. It was in a small community hall. The main performers were four 60-somethings. Three on mouth organs and one on a little drum set (they played the spoons for one song). The concert also included performances by a bass fiddler, a piper (who played the cold pipes in the second half), a singer, 2 young highland dancers and a story/joke teller. They had an intermission which consisted of tea and biscuits, included in your ticket. It reminded me of a cross between a talent show and a family reunion. Fabulous evening! I spent last night and today in Edinburgh. Last night I went on one of the night tours. I have to say it truly freaked me out. I'm a skeptic when it comes to such things as ghosts, etc. After the tour I was less skeptical. I'll leave that tale for another time. On some days I can't believe how fast everything is going... and at other times I feel like my old life is fading away and that I've lived here for much longer! Last weekend I went to Winchester by myself. I didn't have any work on Friday (the only position they offered me was a class I did NOT want to go back to). So I made Friday into my "London Day". I came into town and went shopping at the markets: Camden Town, Covent Garden, and St. Martin's. I took advantage of the day to also plan a weekend away. So on Saturday I took a bus to Winchester (2hours). It was a reat little city with lots of history. The cathedral there is also very beautiful. In the evening I met up with 2 other girls traveling and went out to a couple pubs with them. On Sunday I took another bus ride to see a Jane Austin's House/museum nearby. Today we're in town for "London Day" to see Starlight Express at 3. Tonight we're breaking our daily routine of going to a pub and we are going out dancing. Depending on how I feel tomorrow I might come back into town and go to the museum or the Embassy to see an Emily Carr exhibit. - Grime: There seems to be a lot everywhere. I'm actually getting used to it and don't notice as much. - Humidity: it gets very humid here when it doesn't rain. Once it all dumps down the humidity level goes down too. Some days are sooo humid everything is damp... your bed sheets, the couch... forget about trying to dry out your laundry. - Laundry: A little washer in the kitchen shared by 4 girls... then you have to dry everything on a rack in your room for days often (see reason above). If it is nice out I put my stuff on the line outside and that works well, but you never leave the house with clothes on the line, because you never know when it could rain. - Transportation: In someways I'm surprised at how little I miss my car. That said the transportation system in the South East can be frustrating. I read between 50 - 100 pages a day on or waiting for buses and trains. 6:20 - get out of bed - hope Amy is out of the shower. 6:30 - Madly try to get ready for the day. 10:00 - go to bed ... okay well, 11 and 12 some nights. Last week we spent a little tooo much time at the pub!! But as a supply teacher it's great freedom to think... why go home early? No planning, marking or the like! 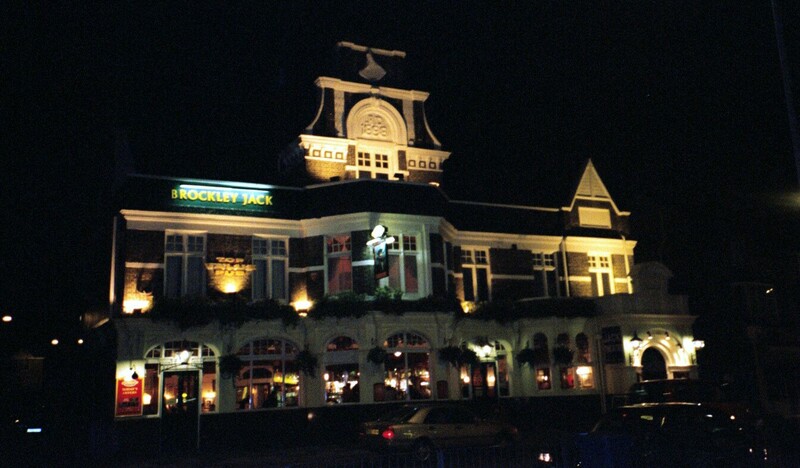 Our local pub, "Jack's" (Brockley Jack's). Radical Travel - Haggis Tour in Scotland.